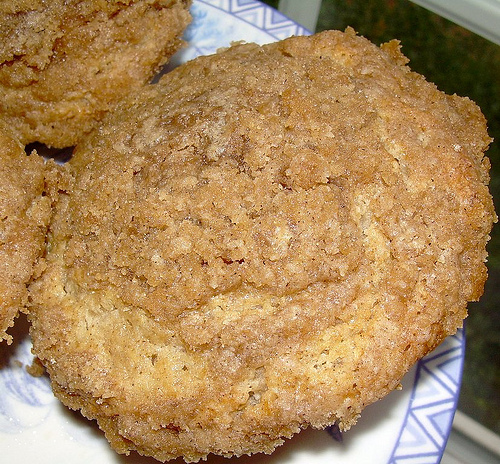 Mrs. Chow's Kitchen » Post Topic » TWD – Allspice Crumb Muffins, or How to Gain a Pound in One Day or Less! Oh, this muffin looks very delicious! Now THAT’S a great looking muffin! That tablespoon of butter sure was tasty. I love the title! Yup, I have gained since food blogging.. I skipped the lemon zest because I didn’t have any. Will have to add next time. Great job on your muffins! Your muffins look absolutely wonderful, I can just taste that crunchy goodness all around the top of those muffins. Great job with muffins and photos! Thanks for baking with me. Yes, these were quite buttery weren’t they? It seems a lot of people had success subbing for the butter, though so I’m going to try that next time. Your muffins look terrific! HA. I agree with the how to gain a pound. Yes, Yes there is. But they were yummy, weren’t they. The topping looks perfect!!! Lovely muffins! Lots of butter, but oh so good! Oh, I know, it was hard not to feel guilty while indulging in these. Yours look delish! I like how crunchy your struesel looks. I know…buttery goodness, right?? And I totally agree with you on the lemon zest, too. It really made the muffins for me! I agree about the lemon zest. They muffins were the bomb. Love your husband’s comment! Yep, lots of taste in this muffin. Yours look absolutely decadent and delightful. Thanks for baking with me this week!